South Carolina’s oyster season will close on Thursday, May 15 at one half hour after official sunset according to S.C. Department of Natural Resources (DNR) officials. Clam season will close on Saturday, May 31. Shellfish harvesting is expected to reopen October 1, 2014. Because of higher bacterial levels that occur when water temperature is above 80 degrees, shellfish harvesting is prohibited during the summer months. Find out more about shellfish harvesting regulations. Coastal waters will remain closed to recreational and commercial shellfish harvesting for oysters and clams until the fall when water temperatures begin to cool making the shellfish once again safe for harvesting. 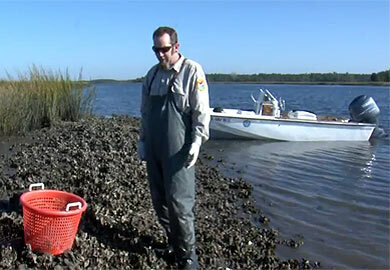 DNR maintains dozens of State Shellfish Grounds for commercial and recreational harvesting of clams and oysters. Twenty Public Shellfish Grounds are managed exclusively for recreational gathering. Each year there are approximately three million dollars worth of wild stock oysters and clams landed in the states commercial shellfish fishery alone. DNR’s Shellfish Recycling and Replanting Program continues its efforts to encourage the public to recycle their oyster shells. Oyster shell recycling drop-off locations are located throughout coastal counties, and collection sites can be found online. During the summer months, DNR returns the recycled shells to shorelines, where it provides substrate for larval oysters to attach, thereby replenishing the harvested beds. When the quantity of shell needed to replant shellfish grounds exceeds those that are recycled, DNR must purchase shells from other vendors. Funding for DNR’s shellfish restoration and enhancement efforts is provided by a portion of Saltwater Recreational Fishing License funds. Late spring and early summer are also the busiest months for DNR’s community oyster restoration program. The public is invited to work with DNR staff and other volunteers to create oyster habitat in areas that are not harvestable. The resulting oyster reefs will provide a host of ecological services including water filtration, nutrient cycling, and habitat for fish and invertebrates. To see the upcoming schedule of events visit the calendar or email the community restoration staff at score@dnr.sc.gov.